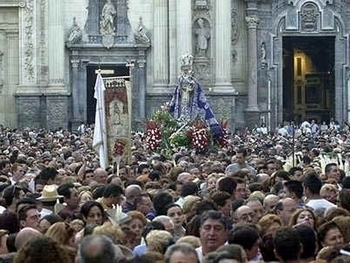 This is one of the most important Romerias on the Murcian calendar, the Virgin of la Fuensanta being the Patrona of the Capital of the region of Murcia, Murcia City. 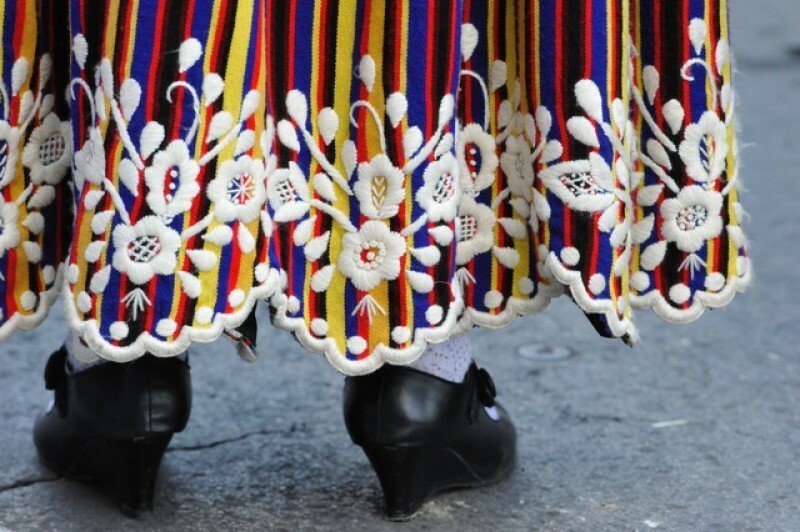 There are 2 parts to this Romeria, the Thursday before the feria when she is brought down from her sanctuary,(bajada) which is high on the hillside driving into Murcia, and then on the day when it concludes, when she returns back home to her sanctuary(subida). 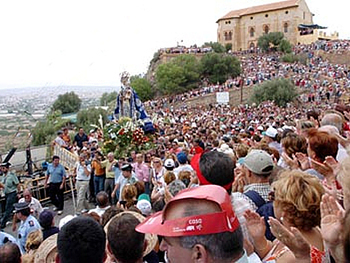 The subida is the day which attracts the greatest participation, estimates being that over 100,000 people participated in the Subida, but the Bajada is also a very special event for the murcians. Her actual Holy Day is the 8th September. The Virgen first appeared in el Hondoyuelo, where there is a natural water spring, which became known as the " Fuente Santa" the holy well, or source. A small hermitage to her devotion was built on this site, which has now become the sanctuary of Fuensanta, a distinctive building which nestles in the wooded hillsides and is cared for today by Benedictine Monks. During the Middle ages the Virgen de la Arrixaca was the Patron saint of the city, but during 1694 there was a terrible drought, and despite the entreaties of the population for rain, the Virgen did not intercede and the water deposits remained empty. However, the residents entreated the Virgin of the holy spring to intercede on their behalf, and miraculously, just as her Romeria was concluding, the heavens opened and down came the desperately needed rain. This same thing happened again in another dry year, so, taking the hint, the murcians decided to go where they were obviously being told to go, and made the Virgen de la Fuensanta their patron instead. The figure of the Virgin which is carried down on Thursday is by Jaime Bort and dates from the eighteenth century, and the child she carries is attributed to the master himself, Francisco Salzillo. 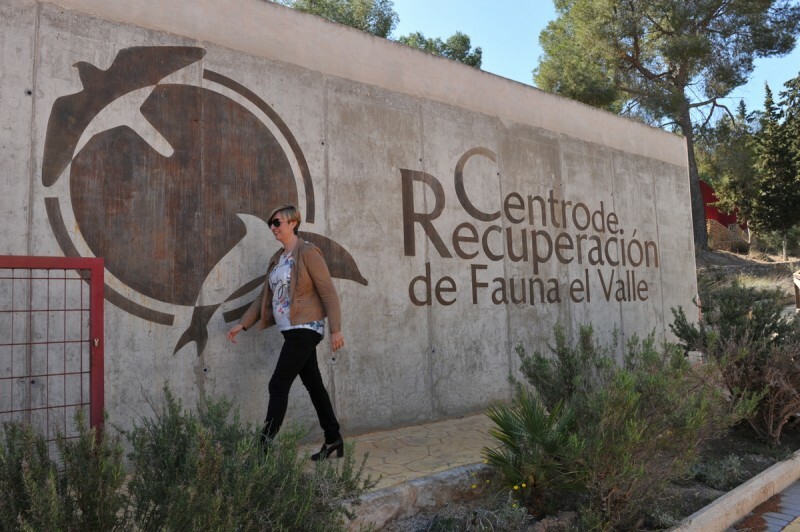 Its quite difficult for participants to follow all of this unless the whole thing is carefully planned, as the Sanctuary is a good distance from the centre of Murcia. 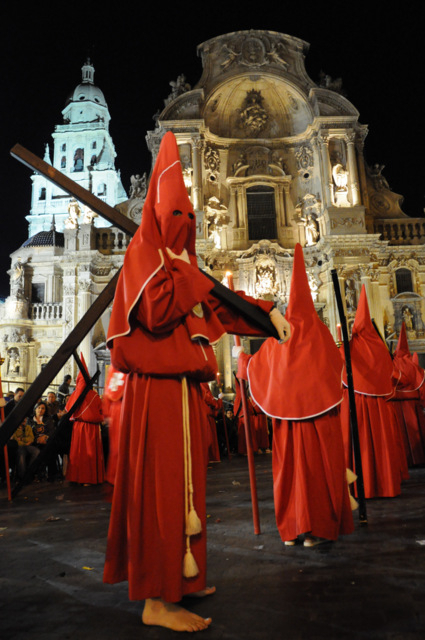 There is a bus, number 5 , which leaves from the centre of Murcia up to the sanctuary, but on this day it is likely to be packed. It might be better to plan to do part of the route, either the start or finish. From the motorway Cartagena-Murcia, come off at the exit marked for Beniajan, La Alberca. There is only one road which runs along the foot of the Carrascoy Regional Park. It may be best to try and park at the bottom and walk up the hill, which although it is a longish walk, is probably the best option, as unless you get to the top of the hill a good 2 hours before it starts, you wont get anywhere near it. Its a glorious place for a picnic, and we‘ve enjoyed many happy sandwich sessions on these hills after a hard mornings research in the capital. 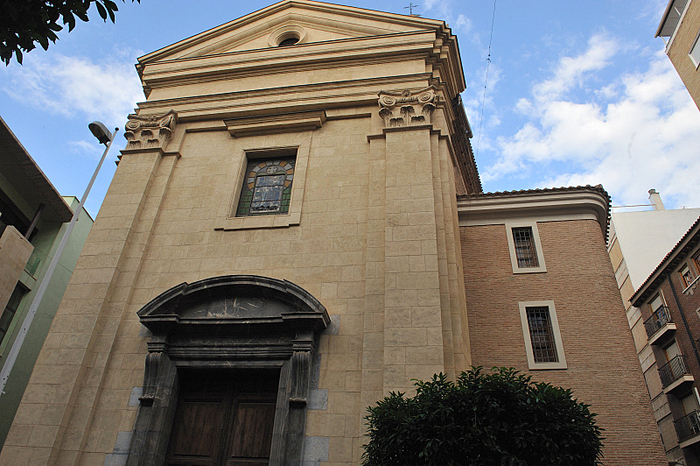 Click for map, Santuario de la Fuensanta, Murcia NB, the blue line is a railway track, not the road you follow by car. 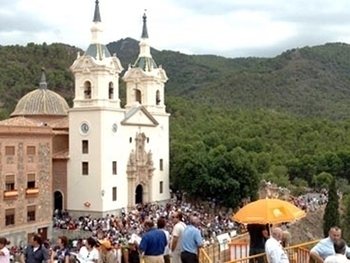 There will be thousands of people attending and following this Romeria, its quite an experience, something very special and very unique, but be warned, there are a lot of people here, so watch your wallet. You can watch her coming anywhere along the route, and she will be accompanied by thousands of people, many of whom walk all the way with her. Route: Santuario de la Fuensanta, C/ Subida Santuario de la Fuensanta, C/ Santuario de la Fuensanta, MU-302, C/ Saavedra Fajardo, Ctra. 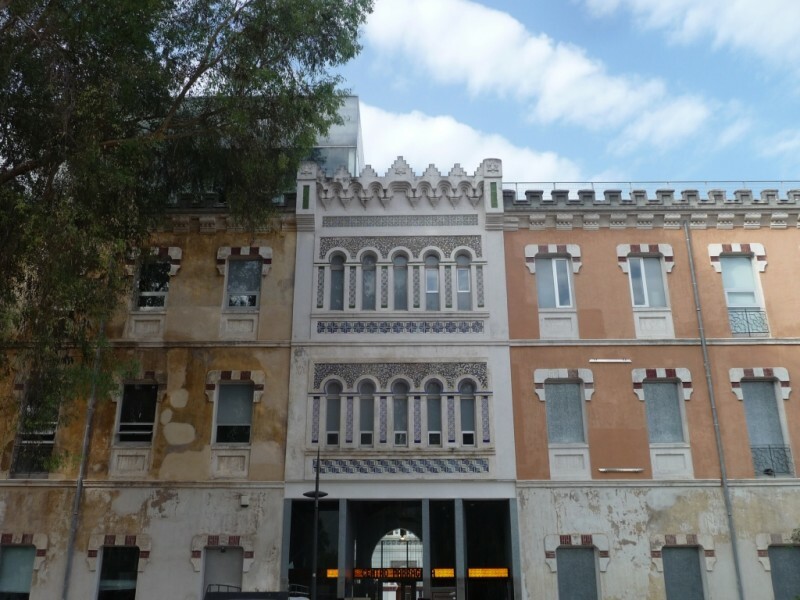 de Algezares, Barrio de El Progreso, Santiago el Mayor, C/ Torre de Romo y C/ Princesa (Iglesia del Carmen). Then after the reception at 7.30pm: Alameda de Colón, Puente Viejo, Plaza Martínez Tornel, C/ Tomás Maestre, Glorieta de España, C/ Arenal y Plaza Cardenal Belluga. 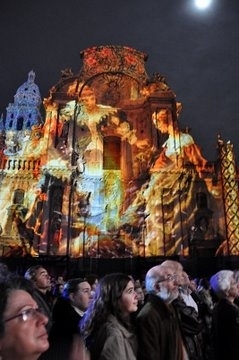 Having arrived at the cathedral, she then remains there throughout the Feria, before then returning to her mountainside sanctuary until Semana Santa next year.